On Thursday, May 15, Stockton Mayor Anthony Silva spent the night in a cardboard box. Silva’s outing at Harrison and Church streets was largely a made-for-media moment — a chance, he said, to draw attention to the plight of the city’s homeless. He also put forward an idea that he hopes can help more people get off the streets and into housing: setting up warehouses as job training centers that would be staffed by existing nonprofits, giving people the skills to achieve an income and pay for a home. It’s a good idea and an even better sound bite for a politician trying to salvage his public image. It’s the second time in three months Silva has talked publicly about facing and fixing Stockton’s “homeless problem” — signaling a new policy priority for the mayor as his four-year term nears its halfway point. But the “homeless problem” in Stockton can fairly be called a problem regarding housing, especially when it comes to homeless people and others living on extremely limited income. On any given night, 235 people are estimated to be on the streets in San Joaquin County, most of them in Stockton. According to annual information gathered by local agencies and the county, an additional 1,325 individuals reside in shelters or temporary housing for people with nowhere else to turn. Estimates from agencies that help the homeless suggest thousands more are on the knife-edge of homelessness at any given time — just a day or two away from an eviction, or kept off the streets by sleeping on a friend’s couch, crashing in a family member’s garage or subsidies like Section 8 and General Assistance. The reality is that the face of housing insecurity is not just a ragged man strung out on drugs — the reality includes everyday families and individuals, many of whom actually have some type of income. It’s a reason why addressing homelessness in San Joaquin County must be a multi-faceted strategy. Job training as suggested by the mayor can give people skills to lift themselves out of their situations. As would hiring more professionals to keep homeless individuals on track toward mental and physical wellness, which are often stumbling blocks on the road to self-sufficiency. But housing — specifically housing that’s affordable to those who find themselves living in homelessness or on its brink — must also be part of the conversation. For housing to be “affordable,” according to HUD, a household shouldn’t spend more than one-third of its monthly income on rent/mortgage and utilities combined. The median income for a household in San Joaquin County is $53,895, according to the U.S. Census Bureau. That leaves a median-income family $1,527 a month for its housing needs. But many families, especially single-parent families, earn less than $1,527 a month in total. Even when California’s minimum wage jumps from $8 to $9 an hour in July, a household with a single full-time minimum wage earner will only pull in around $1,450 a month, leaving less than $500 a month for rent and utilities. Of course, a family in that situation would qualify for some type of government assistance for food, and possibly rent. But fair market rent for just a one-bedroom apartment in San Joaquin County is $709. And when you consider that $580 is a typical monthly rent for a one-bedroom apartment in the 95202 area code — hardly the city’s swankest —it’s easy to see how a small hiccup in finances can lead to households being squeezed into homelessness. For those the mayor envisions helping with job training — unemployed homeless individuals and families — finding housing is oftentimes an untenable proposition. If the head of household is permanently disabled, as is the case with many homeless individuals, Supplemental Security Income could contribute as much as $877 monthly. A family with one adult and two children receiving TANF (formerly known as welfare or cash aid) can expect up to $608 a month. But that type of income is all many homeless households have when it comes time to paying rent and obtaining other necessities. Even with the $400 or so that a three-person family would get in food stamps, finding “affordable” housing means shelling out somewhere in the $200- to $300-a-month range, making it a nigh-impossible challenge. And solving the homeless dilemma is not as simple as finding a job. If the household includes a single mother with a child too young for school, where will the money come for child care? If there’s no family or friends willing to do the job for free, or if assistance programs are too impacted, that money is coming out of the family’s income — probably enough of a drain that it could negate any financial gain from getting employment in the first place. If we as a city — or society as a whole — are serious about helping reduce and end homelessness, it’ll take a wider concerted effort. And money. Money to build housing that is affordable to people who need help getting back on their feet. Money to subsidize rents for existing apartments and houses. Money to employ people who have the expertise to guide families with few to no real-world skills to set up budgets, manage mental and physical health issues and get their lives in order. Money to care for and educate children to break cycles of poverty. Money to run job training for those who are able to work but not currently employable, such as the program suggested by Silva. But money alone won’t solve the problem. It takes the will of the community and the dedication of individuals, both of the employed and volunteer variety. And at some point, more resources are necessary if homelessness is going to become a thing of the past. Currently, federal government contributes more than $5 million to the county for transitioning people from emergency shelters to stable housing in the hopes that they will become self sufficient with the proper support. The city of Stockton also receives $4.5 million in federal aid that could be used for homeless shelters, affordable housing projects and short-time assistance for people trying to stay off or leave the streets. But some of that money directed to the city is often used for other community projects that are deemed a higher priority. Sad as it might sound, the money and energy currently devoted to helping people avoid and climb out of homelessness is not enough. There are dedicated individuals and organizations working tirelessly — and successfully — to make positive, life-changing impacts for individuals in San Joaquin County. But the attention is not widespread enough to create the needed groundswell to make more of our community whole. Mayor Silva’s stay on the streets focused the city’s attention on homelessness for a day. But it will take a serious, sustained drive to change the reality of homelessness in Stockton. Great article Jon, keep up the good work. I think the homeless problem is America wide– and Stockton would be a great place to start fixing it. Hopefully, more folks within the homeless population will accept the assistance that is offered. I just completed a 4-year term of service as a commissioner for the Housing Authority of San Joaquin County. Speaking for myself, I found that there are those who refuse housing because they are unwilling to adhere some pretty basic regulations, such as curfews and a prohibition of alcohol and drugs. We heard from VA representatives that there are homeless veterans who refuse help because of a ‘warrior mentality’; those who have served our country but resist help because of their “don’t offer me any handouts… I can make it on my own” mentality. Each year, the Housing Authority provides 40 housing units for the homeless population during the winter months, in spite of the cost of repairing vandalism. For many, homelessness is not a state of condition as it is a state of mind. I realize that my comments are harsh for some, but I speak the truth. David — absolutely agree. 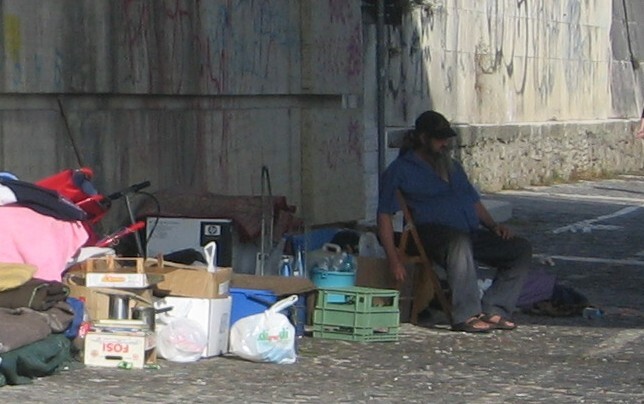 The homeless population is as diverse, and with as many different personalities and drivers, as the general population. There’s no one-size-fits-all answer. But I still believe there are basic approaches that can work, most of them just seem to take a large amount of dedication on a person-to-person level. Thanks for this thoughtful piece and for highlighting the challenge of a family trying to pay rent and live on SSI. Hope this is the beginning of an important federal, state, and local movement to adress the rising number of homeless individuals. Thanks for pointing out that it’s a multi-faceted issue-housing, income, child care, health-are all part of the solution.